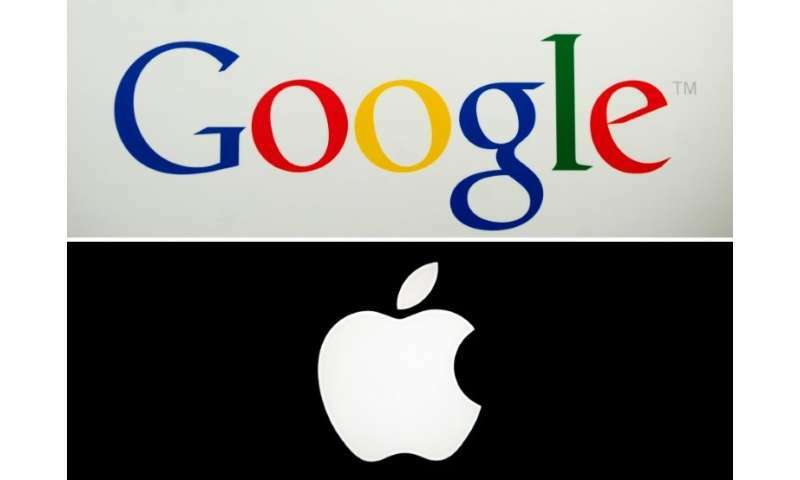 The French government said Wednesday that it would take Google and Apple to court over "abusive business practices" against smaller rivals, threatening fines that could further strain transatlantic ties as fears of a trade war grow. "I believe in an economy based on justice and I will take Google and Apple before the Paris Commercial Court for abusive business practices" against French start-ups, Finance Minister Bruno Le Maire told RTL radio. He said in particular that the two US giants imposed financial conditions on French app developers while siphoning data on their use, and that both Apple and Google "can unilaterally modify contracts". Technology start-ups are a favourite of French President Emmanuel Macron, who has sought to overhaul the nation's laws and regulations to allow entrepreneurs to flourish. App developers, for example, were unable to negotiate the fees for having their products listed in Apple's App Store or Google Play. The fraud office urged in its report fines of two million euros ($2.5 million) for each company, the ministry source said, though Le Maire said only that they would be "in the millions of euros". Apple declined to comment immediately on Le Maire's claims, but Google said its business practices "conformed to French law". "We are ready to explain our position before the courts," it said. France's Digital Minister Mounir Mahjoubi has often criticised the "golden prisons" for internet users, whose access to content is controlled by US technology giants. The government's latest moves dovetail with a lawsuit filed against Apple by a French business software start-up, Nexedi, 18 months ago—a case that will also be heard at the Paris Commercial Court from May 31. The developer says Apple had required it to install certain software elements in its own apps in order to secure access to the App Store. "We are very happy and reassured that Bruno Le Maire has reacted," Nexedi's CEO Jean-Paul Smets told AFP. "We're expecting a lot from this suit, and we're not the only ones." Apple is also under investigation by Paris prosecutors over suspected "planned obsolescence" in some iPhone models, after the company admitted to slowing down older models to preserve battery life. Google, for its part, was handed a record fine of 2.4 billion euros by the EU last June for illegally favouring its shopping service in search results, a penalty it has appealed. France was already pursuing Apple, Google and other US technology giants over the legal strategies that let them route their income from across the EU through low-tax nations. That leads companies to declare their earnings in countries like Ireland, the Netherlands and Luxembourg, depriving other member states of revenues even though they may account for a bigger share of the earnings. European officials are preparing to announce next week an "electroshock" plan for taxing digital economy revenues which would make companies pay a greater share of their taxes in the countries where they earn their profits. The legal and fiscal wrangling comes as US President Donald Trump has fanned fears of a wider trade war, pledging to impose a 25 percent tariff on imported steel and 10 percent tariff on imports of aluminium. It is unclear if European nations will obtain waivers, especially after Trump singled out the EU as treating the US "very badly" in trade ties and threatening to tax cars as well. The European Commission, the 28-nation EU executive body, warned Wednesday that it would impose countermeasures on flagship US products including peanut butter, orange juice and bourbon whiskey if Trump goes ahead with the metal tariffs.